Just to give you and idea how awesome Evernote is, this entire book was researched using Evernote Web Clipper. I would find great content that I wanted to reference later, so I would save the web page or clip the article directly into Evernote. This was invaluable for writing this book. Anytime I wanted to find content I just searched and Evernote would display the content nicely. To use Evernote Web Clipper, click the Evernote icon on the toolbar. The first time you use this extension/plugin you need to login with your username and password. You can choose what Notebook you want to put the article in and add tags and comments. The clip button gives you an option of clipping the article,URL or full page. If you use the latest chrome extension the window is now a sidebar with more options. The old way of bookmarking or adding favourites is dead. 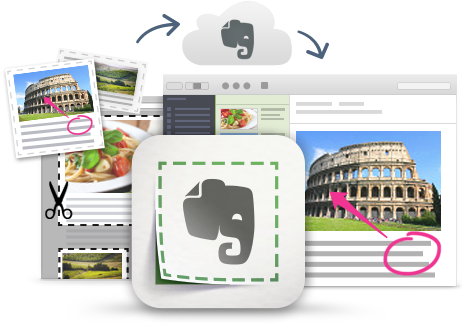 Evernote Web Clipper allows you to save and search later. Most favourite/bookmarking tools allow you to search, however it is usually limited to the title of the page and the description. With Evernote Web Clipper all words and images are indexed so that you can easily find something latter.